While Miami struggles to build a baywalk in Edgewater, Miami Beach is now planning yet another walkway for pedestrians. The Indian Creek Greenway would run along the water from the 41st street bridge south to 25th Street, according to a presentation made to residents last week. 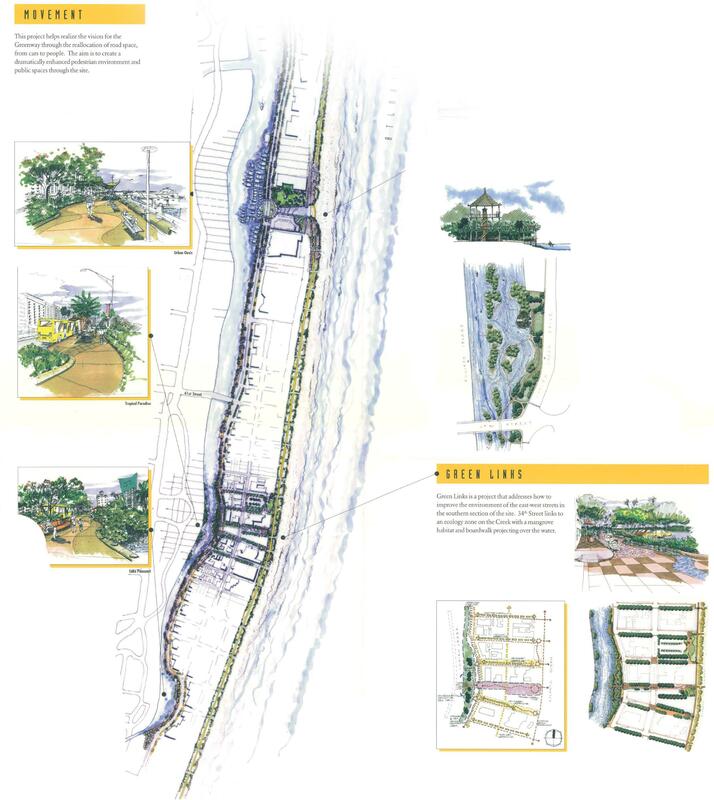 It would provide a continuous path for pedestrians, while also restoring vegetation and introducing new landscaping. Initial funding is in place, according to Miami Beach Greenspace Division Director Rodney Knowles. There is also a plan to request supplemental funding for landscaping if needed. As part of the project, an “iconic public realm” could be built to the north and south, including a plaza or urban waterfront park at the 41st street bridge. Miami Beach gets it. Continue the good work and continue to build non-automotive ways to travel around! And hopefully soon we’ll have some modern public transportation from Miami Beach to Miami City. Not buses or cars! The Metromover would be amazing!! Did City of Miami already cancel their double-decker bus from Bayside to South Beach? “Suspended” starting Jan 17th! Poorly advertised IMO. Never even heard of it myself. Metrorail would be amazing. Metromover would be half-assed unless its upgraded with new full trains, which will undoubtedly require fares. Metro rail stands zero chance of happening. An elevated people mover on wheels (I forget what that’s called) sounds like the best combination of efficiency, cost and public approval. In other words, Metromover? Metrorail is better fit for capacity, pays for itself better with fares, and better connected with places like MIA and two Tri-Rail stations. That is not the main purpose. Grown ups with real jobs use cars. Busses and trains are for kids and losers. There’s the difference between having a forward thinking government and one that is stuck in 1980s cuba. Except when NIMBYs moan about expanding transit or upgrading storm infrastructure to keep their precious house they’ve owned since 1970 above water. Are you a NIMBY? Let’s f-up your home for developer profit! If it raises my property values, I have no objections. Is Miami Struggling to build it or is it just being built slower than you would like? That’s what happens when you have a city commissioner more interested in taking selfies and kissing behinds than getting the bay/riverwalk started. I’m looking at you K. Russell. I wish I see the Edgewater Baywalk before I grow old so I can enjoy it. I don’t understand why they can’t at least connect Pace Park with Museum Park. That is the easiest thing to do and there are no obstructions anywhere and the Womens club and the Herald site are totally clear. Can they get this done before the more ambitious target of connecting Pace Park to the Morningside Park. Haha. That’s actually a good point.